Two happy gemstones together makes everything better! 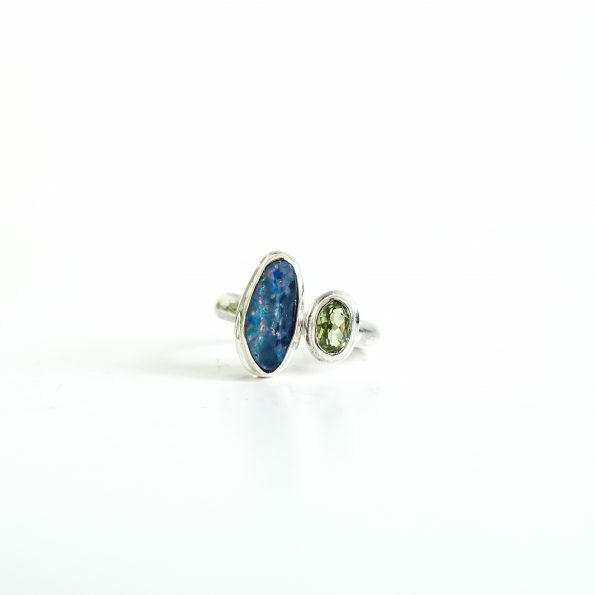 Opals symbolize confidence, loyalty and are seen as representing hope, purity, happiness and faithfulness. Whereas, Peridot promotes responsibility and forgiveness, instilling confidence in one’s own abilities and reestablishing a sense of self-worth. Reach for the sun with the Peridot crystal, an effervescent stone that harnesses the life-giving energy that turns night into day. The Vitamin D of your healing crystal collection, the Peridot crystal meaning is connected to the sun, making it your spiritual cheerleader that keeps you on the sunny side of life. The Peridot crystal shines like a light beam of energy, a stone of happy, light-hearted vibes and the perfect companion to lead you on a path of sunshine. Peridot is a sign that it’s time to feel good, a simple wish and our divine birthright. You want to order this Precious Australian Opal mix ring but you don’t know the size? Use a measurement tape to measure the inner diameter of any ring you have.